Even the most casual coffee drinker has likely crossed paths with the term “Arabica” at some point in their lives. The reason for this, apart from Coffea arabica’s consideration as one of the world’s best highland coffees, is that the plant originates on the verdant plateaus of Ethiopia, located in the northeastern part of the Horn of Africa. Traders referred to the faraway landmass as Arabia. It’s from here that coffee is thought to have been introduced to the world. 2 Sometimes it’s better to be lucky than smart! 3 A concept we still hold dear today! 7 So, Which Are the Best Ethiopian Coffee Beans? The legend purportedly begins with a goat herder named Kaldi, who noted that his flock would become particularly energetic after nibbling on the berries of a certain bush. When a Sufi monk-friend unwittingly tossed the collected berries into a fire, believing them to be inconsequential, the aroma that sprang forth wafted permanently into the annals – and nostrils – of human history. Sometimes it’s better to be lucky than smart! More than likely, however, the story of Kaldi is fictional, and the reality is a bit less surprising. The Ethiopian nomadic mountain peoples of the Galla tribe gathered the coffee beans, ground them up, and mixed them with animal fat, forming nutritious balls of energy that served to sustain them over long journeys. Other indigenous tribes of Ethiopia ate the beans as a porridge or drank a wine created from the fermented, crushed coffee beans. By the 13th century, coffee’s invigorating tendencies were well known in the Islamic world and beyond. Coffee was considered a potent medicine, as well as a religious brew that left worshipers feeling percolated and focused during long prayer hours. Coffee shops in the 15th century quickly became a favored meeting place. A concept we still hold dear today! In contemporary Ethiopia, old customs still hold true. Each day, families gather around the coffee pot, known as a “jebena“, and brew rich, pungent Ethiopian coffees in a traditional coffee ceremony that’s anything but instant. The green coffee beans are roasted on an open flame and then ground in a mortar and pestle. After a boiling and screening process, the coffee is served as it’s meant to be: amongst family and friends amidst conversation and relaxation. Contemporary farmers in Ethiopia have carved quite a niche out of the $20 billion dollar global coffee industry. In fact, Arabica beans represent 59% of the the world’s coffee production, placing Ethiopia as the world’s 5th-largest producer. According to International Coffee Organization, Ethiopia is Africa’s top producer with an estimated 880 million pounds of product in 2015. Fun fact: Ethiopians consume just over half of their total production themselves! The governmental body that oversees business with regard to all things coffee and tea, including the determination of the price at which the washing stations buy coffee from the local farmers, is appropriately called the Tea and Coffee Authority of Ethiopia. The market is heavily regulated through licenses, with the goal of avoiding domestic market concentration. Interestingly, even with such high volume, the methods in which Ethiopia’s coffee is produced hasn’t changed much since the 10th century. In fact, nearly all of Ethiopian production is still done by hand, from planting new trees to the final pickings. With any luck, Eliot had the pleasure of tasting Ethiopian varieties. These special beans have become so admired that four of the regions in which they’re grown are marketed and trademarked under that area’s name. At larger-chain coffee houses today, the region is often more recognizable than the country! Let’s take a minute to highlight each of the big four. The Harrar region of Ethiopia is located in the Eastern highlands, and is home to some of the oldest coffee beans still produced. It produces flavorful and aromatic dry processed coffee, also known as unwashed or natural coffee. This variety is harvested from the higher elevations of the Sidamo (also Sidama) region of Ethiopia near the village of Yirga Ch’efe. Ethiopia Yirgachefe is typically wet-processed, meaning that it’s washed. The Yirgachefe variety is largely considered to be the pinnacle coffee crop of Ethiopia. The central highlands of Ethiopia is where the revered Sidamo region is found. This is most likely where coffee originated, whether the legends are true or not. This bean is also wet-processed. At these elevations, the growth rate is slowed, therefore allowing the coffee to absorb more nutrients, creating a more robust and bright palate. A bit west of the capital, located centrally in Ethiopia, is the Limu region. This variety is also a wet-processed coffee and tends to be in its sharper than other Ethiopian coffees, which some people strongly favor. Each region possesses its own distinct characteristics and flavor profile, but maintains the smooth, rich acidity and slightly citrusy taste for which Ethiopian Arabica coffee beans are best known. Because of the rich flavors and individual features of the beans, there simply isn’t a category of “best Ethiopian coffee beans” on offer here. From the individual tastes of the consumer to the nature of roasting and brewing, this whole process is very personal. According to the Barista Institute, one unusual but fascinating aspect of enjoying Ethiopian coffee is that while we might know which region the coffee came from, it’s nearly impossible to tell the variety. The story goes that Panamanians once stole the legendary Geisha variety, which is considered the most prestigious and valued in the world. So, Which Are the Best Ethiopian Coffee Beans? So how do we choose an Ethiopian coffee bean to try? If you’re new to Ethiopian coffee beans and looking for a great roast to try, here are two options. The light-roasted, fruity flavor profile of Stone Street Coffee Company’s Ethiopian Yirgacheffe is a definite recommendation. 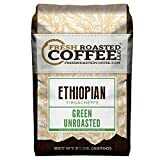 SINGLE ORIGIN WHOLE BEANS: An award-winning, deliciously unique, & complex cup - Hailing from Africa - southern Ethiopia (considered the birthplace of coffee), Ethiopian Yirgacheffe consistently ranks among the best coffee in the world! 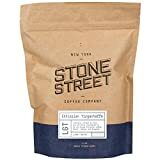 Though it’s a light roast, the Stone Street Yirgacheffe is still an intense coffee that enlivens the palate with the familiar, distinctive Ethiopian floral bouquet, but also a mellow smoothness that’s both unique and bright. The medium-roasted, winey and complex nature of Ajuvo Ethiopian Coffee’s Limu variety makes it a spicy and sultry recommendation. Ajuvo’s Limu coffee is distinguished by noticeably deep flavors, with fruits and citrus tones. The Oromo Coffee Farmers Cooperative Union claims that the extraordinary taste comes from the coffee beans growing next to bananas, cinnamon and tea plantations. Just remember: The lighter the roast, the more caffeine you may have in your cup! Custom roast this green coffee to fit your own unique tastes. Five pound (5 lb.) Bag. Single Origin. Many of us tend to measure our existence just as T.S. Eliot did – by coffee spoons. And if so, Ethiopian coffee gives us excellent motivation to savor the enduring legacy of its rich history. Given that it’s as robust in taste and complexity as it is in stature among the world’s coffee communities, Ethiopian coffee could well be your next java obsession.